Eight other cast members deserve a very special recognition….special not only because they are 12 and under, but they are the core of the show….they sing, dance and win hearts big time. At the center is a delightful young lady, Gracie Nagle, a seven-year veteran of CSC’s Young Performers Workshop, making her professional debut. What can I say; she won my heart from the first moment she started to sing the show’s hit song, "Tomorrow." 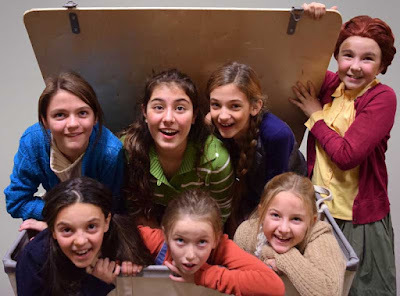 Annie’s six orphanage pals, Tess Clark (Molly); Annabelle Plociniak (Pepper); Olivia Budd (Duffy); Mary Young (July); Violet Caruso and Nancy Pereyra (Tessie) sing and dance with charm, enthusiasm, and impressive energy. In other words, they are obviously enjoying their moments in the spotlight. The eighth cast member who performed as a stage veteran was Clementine (Sandy), a rescue dog! The ensemble includes Joe Anthony, Muriel Baki, Nick Bettens, Jenna Black, Nicole Boscarino, Will Brockman, Alan Bronstein, Serena Buchan, Jerry Caviston, Jessica DeFort, Tatiana Garcia, Sebastian Gutkin, Kayla Hartman, Kira Herkenham, Matthew Hollis. AJ Lewis, Rachel Lee, Megan Moran, Brianna Morris, Tim Nagle, Victoria Pulido, Alani Rose, James Russo, Lauren Santarelli, Jibril Scott, Jack Scarsi, Matthew Sigler, Maxinne Spann, Saquan Williams, David Atticus Yawger, Jackson Yawger. The fine orchestra led by music director Jared Lee includes Tara Crincoli, Sean Francios, Tim Wendt, Jim Lutz, Angela Williams, Emily Jones, Nicole D'Angelo, and Benjamin Saporito. Director/ choreographer Michael Blevins' creative staff includes Jeff Chase technical director; Aaron Porter and Ashleigh Poteat set design; Aaron Porter light design; Maxine Spann sound design, Ashleigh Poteat costume design; Dani Pietrowski prop design; and stage manager Kelly Fitzgerald. The producers are Carl Wallnau, CSC Artistic Director, and Catherine Rust, General Manager. Let’s skip to the chase; this a wonderful warmhearted production that will have ALL family members smiling. 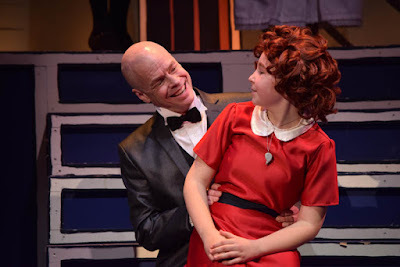 Perfect holiday treat will be a visit with everyone’s orphan, Annie, at the Centenary Stage Company’s Sitnik theater in the Lackland Performing Arts Center until December 9. Oh, "remember, you are never fully dressed without a smile."